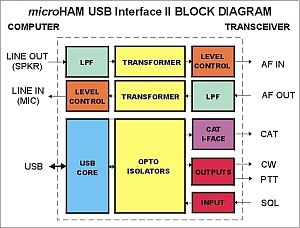 The USB-II interface by microHAM is a USB interface for CAT and soundcard AF. This interface offers the usual level converters for nearly all CAT interfaces, electrically isolated lines for PTT and CW keying, an input for a squelch signal and electrically isolated audio interfaces. This makes this device ideally suited for all users who wants to run digital modes from the soundcard. Unlike common computer mass market "USB to Serial adapters" our USB Interfaces are carefully designed for maximum immunity from strong RFI and at the same time be "RF quiet". Each data line is low pass filtered for minimum interference. The only known product of USB chipset clock is a beat at 144.030MHz. Drivers for all version of Windows, incl. Windows Vista® and Win7 32/64 Bit. The USB-III interface works with all computers with USB connector. microHAM USB Device Router and microHAM Device Configurator are compatible with all 32bit and 64bit versions of Windows 7, Windows 8, Vista, XP, 2000 and 2003. For 'real' FSK keying one would normally require a true UART chip in the computer (parallel to serial converter, COM-Port). With a virtual COM port such a device is simulated by the USB driver, but only with some problems. Depending on the load of the computer the timing of keying can vary (jitter) or be delayed (latency). This leads to not very clean telegraphy keying. With RTTY/FSK the characters might be illegible on the receiving side due to timing errors.